FIRST Robotics Competition team 525, Swartdogs, finished off 2016 with a fun month of December. To start the month, we hosted the annual Cedar Falls FIRST LEGO League (FLL) Regional Qualifier. At the regional qualifier, FLL teams spent the day participating in three robot matches, explaining their projects, and demonstrating their robots to judges while having a ton of fun. 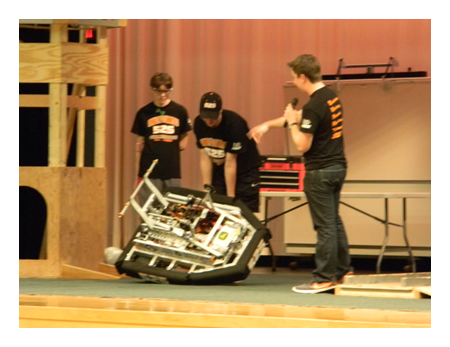 Swartdogs team members helped throughout the entire day along with setup and teardown. The day before the competition, we helped prepare Peet Junior High School by setting up judging rooms, putting up signs, moving tables for robot matches, organizing the pits, and coordinating food. During the competition, we sold concessions, monitored hallways, queued teams for matches, staffed practice tables, demonstrated our robot, sold pizza and drinks at lunch, ran the music and timer during robot matches, and other various jobs as needed throughout the day. While the judges were deliberating, we demonstrated our robot from last season, Cricket, and talked about FIRST Robotics Competition (FRC), the 2016 FRC game, the similarities between FRC and FLL, how our robot works, and the parts of the robot. After the awards ceremony, we helped with tear-down and clean up. Overall, the day went very well and the FLL teams had a lot of fun. Team 525 would like to give special congratulations to all teams who participated at the Cedar Falls FLL Regional and a big thank you to all of the volunteers who helped make this day possible. Next, in preparation of our build season which starts January 7th, we ended the month with a safety presentation. To insure that all team members have an understanding of safety precautions, John Deere employee Eric Fuessel taught us safety tips. His presentation included information about safely using basic and power tools, wearing proper clothing and shoes, and other important safety information that we will need to know throughout build season and during competitions. Overall, the presentation was very informative and we thank Mr. Fuessel for helping keep our team safe. 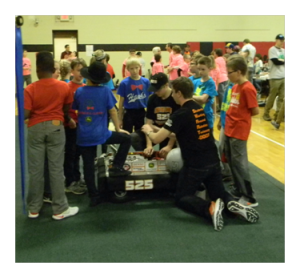 Overall, as we finish 2016, we want to give a huge THANK YOU to everyone who has helped make 2016 an amazing year for team 525; especially our mentors, sponsors, and parents. 2016 would not have been the same without the support of these people. For that, we are very grateful. Now, we anxiously await the start of 2017 and all of the possibilities it holds for team 525.